Many creative geniuses will tell you that creativity just comes to them, as if it is an invisible force. That’s why – as described in my book – Picasso said he never searched, but simply found and Mozart “just copied the music he heard in his mind.” But Thomas Edison, the most prolific inventor of all time, said genius is not at all built on an effortless ability. 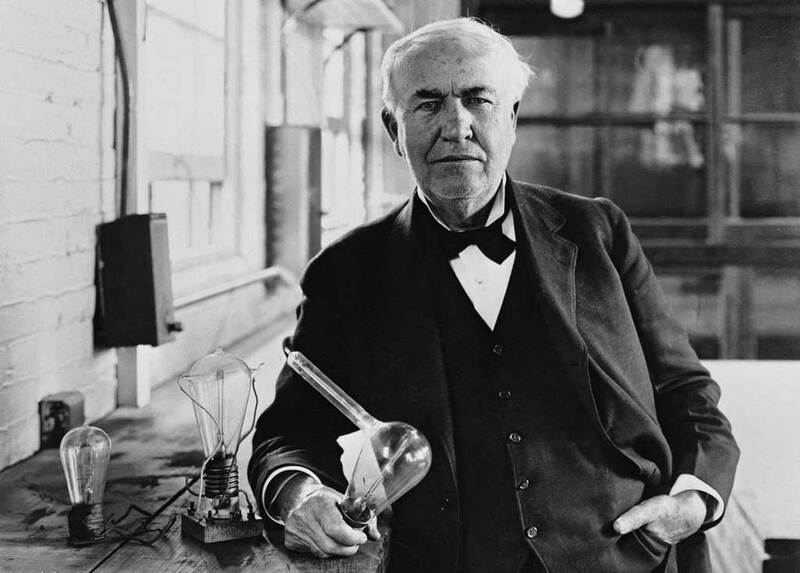 Edison described genius as 1% inspiration and 99% perspiration. Which is why he also said: “Opportunity is missed by many because it wears overalls and looks like work.” Together with ‘diligence’ I’ve discovered a total of 15 ingredients turning Edison into the creative genius he was. Thomas Alva Edison was born on February 11, 1847, in Milan, Ohio. He grew up in Port Huron, looking out on Lake Huron, one of the five Great Lakes of North America. Edison didn’t attend public school for very long. One of the reasons was that his mind often wandered. This made him unfit for the traditional schooling system. So, instead, his mother, a former schoolteacher, taught him at home. Young Edison loved to read and was especially interested in science. But he was also interested in the world outside of Port Huron, he got a job on the train at the age 12 and devoured the newspapers he sold on it. The Grand Trunk Railroad, connecting Port Huron to the nearest big city, Detroit, played an important role in Edison’s life. It not just provided him with reading material, but also kindled his entrepreneurial side. Edison obtained the exclusive right to sell newspapers on the railroad, and after a while he even printed his own newspaper. This made him realise he had a knack for making businesses work. Edison kept investing the money he earned into new ventures and was thus able to constantly upscale his productivity. Throughout his life Edison would eventually found 14 companies, among them General Electric, which is still one of the largest companies in the world. When Edison was 16, his life took an unexpected turn. A telegraph operator’s young son, Jimmie MacKenzie, wandered onto the train tracks in front of a rolling freight car. Edison grabbed the kid just in time and saved his life. As a reward Jimmie’s father taught Edison how to become a telegraph operator, a prestigious job that required fast thinking and turned codes into words, and vice versa. A job that matched Edison’s skills, but at the same time a job he wouldn’t have easily obtained. It proved a big opportunity since the technology of telegraphy – patented in 1840 – had enormous potential. In hindsight telegraphy can be easily compared to the invention of the telephone or the internet; it functioned as an information highway – and the telegraphers were the hubs that connected the information. This new job became an important source for most of Edison’s later inventions, because it taught him the important basics of electricity. Serendipity is an important part of creativity. However, you have to seize the opportunity, like Edison did, to turn it into a creative product. In Boston in 1869, Edison filed his first patent. He created an electrical vote recorder for the Massachusetts State Legislature. He quickly found out though that the politicians weren’t interested in speeding up the process of voting. Later Edison would acknowledge this as a valuable lesson; it taught him never to invent something that people don’t need. 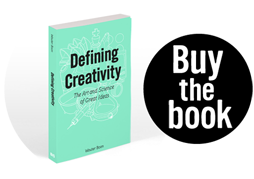 This is something also described in my book; we can all be creative on a personal level, but if you want your creative products to last beyond your own life – thus becoming “historically creative” – they need to be valued by an audience. 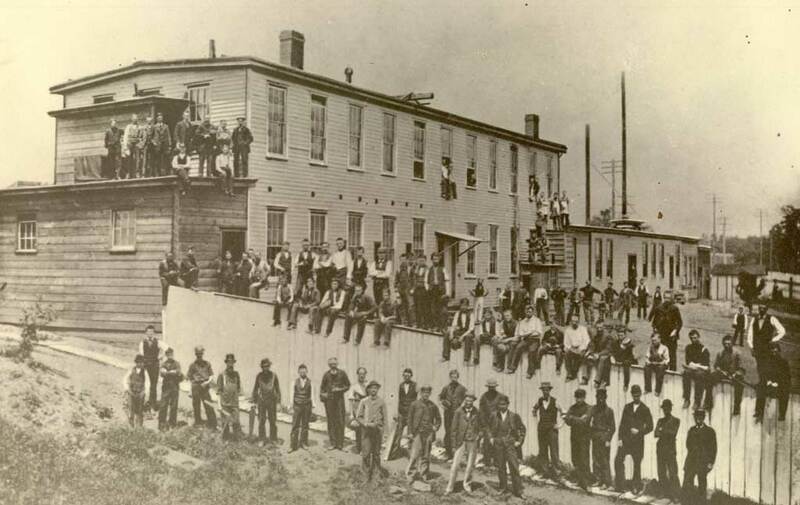 In 1871, Edison set up a workshop and laboratory in Newark, New Jersey, a stone’s throw from New York City. The reason why he settled there is that Newark was known for a community of machinists, who had exactly the experience Edison could use for his telegraph-related inventions. Edison’s ‘Invention Factory’ at Menlo Park, New Jersey. In 1874 Edison had his first big financial success with a ‘quadruplex’ telegraph system, which allowed to send more than one message over a single wire. He sold it to the Western Union Telegraph Company for a whopping $40,000. In 1876 he invested this money in his own laboratory complex at Menlo Park, a town in New Jersey on the main train line between New York City and Philadelphia. This site would become known as The Invention Factory. He chose the location because the land was cheap, but also because it connected well to the big cities, where the money was. At Menlo Park Edison hired many different specialists, who catalysed his ideas and helped to turn them into reality. This site is comparable with todays Silicon Valley (coincidently home of another Menlo Park), located close to San Francisco, and a place where a lot of knowledge and skills have flocked together, catalysing creative collaborations. Edison also chose for Menlo Park because it didn’t have the distractions of the big cities. He worked long hours in his laboratory, quite unaware of the time. In fact, he deliberately didn’t have a clock in his workroom, so that he could forget about time. He sometimes worked for 16 hours at a stretch, which gained him a reputation for not sleeping. But Edison did take naps. Whenever and wherever he needed them – even on his workbench. This wasn’t the only way he recharged his batteries. The laboratory had a pipe organ at the back and often around midnight Edison himself would play it and everyone would sing along and have a drink. Generally, it is important for creative minds to find relaxation. This not just suits the purpose of recharging the batteries, but it is also important for incubation, the phase in the creative process during which the acquired knowledge gets a chance to sink in, be reorganized and combined with other (seemingly irrelevant) ideas by the unconscious brain. Though Alexander Graham Bell was the first person to patent the telephone in 1876, Edison improved the transmission of the speaker’s voice across the wire. The experiments that led to this improvement used a diaphragm with an embossing point that was held against paraffin paper. 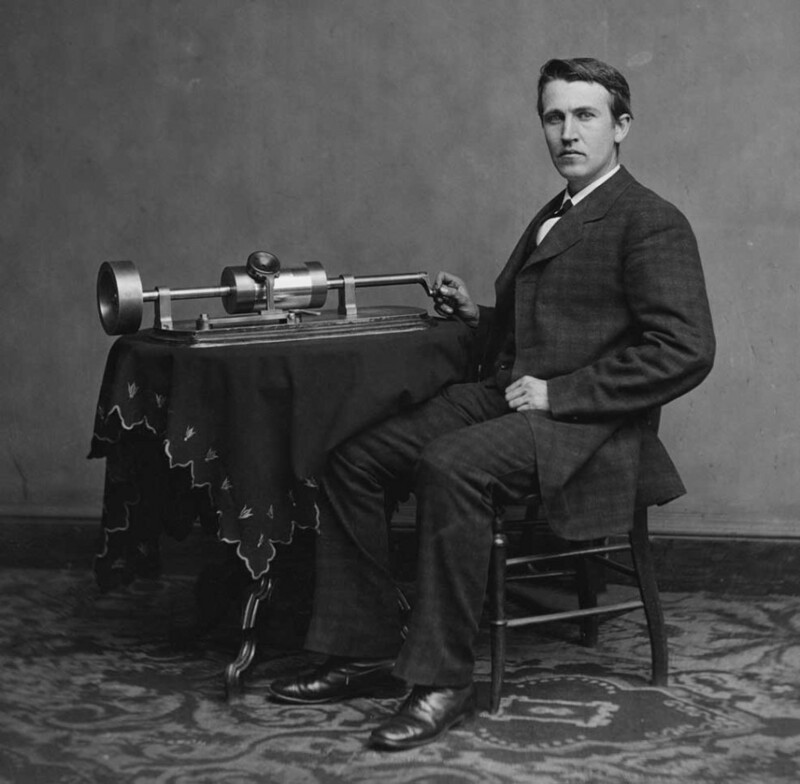 He took these elements and incorporated them in the invention of the phonograph in 1877 – the picture above this article shows Edison with his phonograph. What’s interesting about the phonograph is that Edison never conceived it as a possible form of entertainment; he thought it would be used by businesses to dictate letters. He was wrong; it brought music into people’s homes. This sounds similar to the invention of the telephone, first dubbed a “speaking telegraph” and not seen as a social device. It shows how difficult it is to predict in what ways new technologies can be used. To see how new technologies can be used in a different conceptual domain requires imagination. Edison did have an imaginative brain though, when he used his telephone-technology into the conceptual domain of recording sound. Of course Edison’s most famous invention was the light bulb. Though electric lights had already been invented to light the streets, Edison introduced it into people’s homes. To do so he needed to bring together a wide range of knowledge about the light bulb itself, the fixtures, the electricity generators and the circuits getting the electricity from the power station to the homes. It was like a big puzzle, he to combine all the pieces into one invention. Making unfamiliar combinations of familiar ideas; that is what creativity is in a nutshell. Thomas Edison with one of his early light bulbs. A very difficult part of the light bulb invention was finding the right material for the filament – the wire inside the bulb. In 1879, after testing more than 1600 materials, including coconut fiber, fishing line, and even hair, Edison and his team finally figured out that carbonized bamboo was the best material for the job. This filament lasted for 1,200 hours, while in the first successful experiment the filament only lasted for 13.5 hours. The idea of using bamboo as the light bulb filament came from Edison’s memory. He recalled examining a bamboo fishing pole, while he was relaxing on the shore of Battle Lake, Wyoming, where he travelled with a scientific team to be able to clearly observe a total eclipse of the sun on July 29, 1878. Making associations with our memory is very important for being creative, since it allows us to use ‘old’ ideas into new combinations. In 1887, after Menlo Park’s success, Edison built a bigger and better laboratory complex in West Orange, New Jersey. There he worked on all sorts of projects. To name a few; movies, mining, batteries and cement. The “Wizard of Menlo Park” never stopped inventing. At the end of his life he had obtained 1,093 patents. No one has ever broken this record. As described in Defining Creativity productivity is a sign of success. Or more accurately, statistically creative minds are most successful when they are the most productive. The reason is that a high level of energy catalyses creativity. In 1899 Edison worked on batteries that could support electric vehicles. He thoroughly believed that electric cars were better than gasoline or steam-powered vehicles. Not a bad believe, you could easily defend today, but at the end of the 19th century, this was not necessarily a logical believe. But Edison was so sure of himself that in 1902 he proclaimed that his batteries would run for a 100 miles or more, though he still had to invent a battery that could do this. It took Edison another decade to invent a battery that could finally drive a car. By then his vision was unfortunately overtaken by the success of the gasoline-propelled car. However, Edison’s batteries were eventually used as railroad signals, miners’ head lamps and marine buoys. Though there was a point where Edison knew that his electric car wouldn’t become the market leader, he persisted in developing the battery as an important attribute for modern life. And eventually he was right; the storage battery became one of his most profitable inventions. I am sure I could find some more elements from Edison’s exciting and energetic life that turned him into a genius. The main learning though is that creativity is not something that is simply offered to us by the muses, but something that requires hard work and many different internal qualities and external circumstances.